PICK THE RIGHT MODEL. 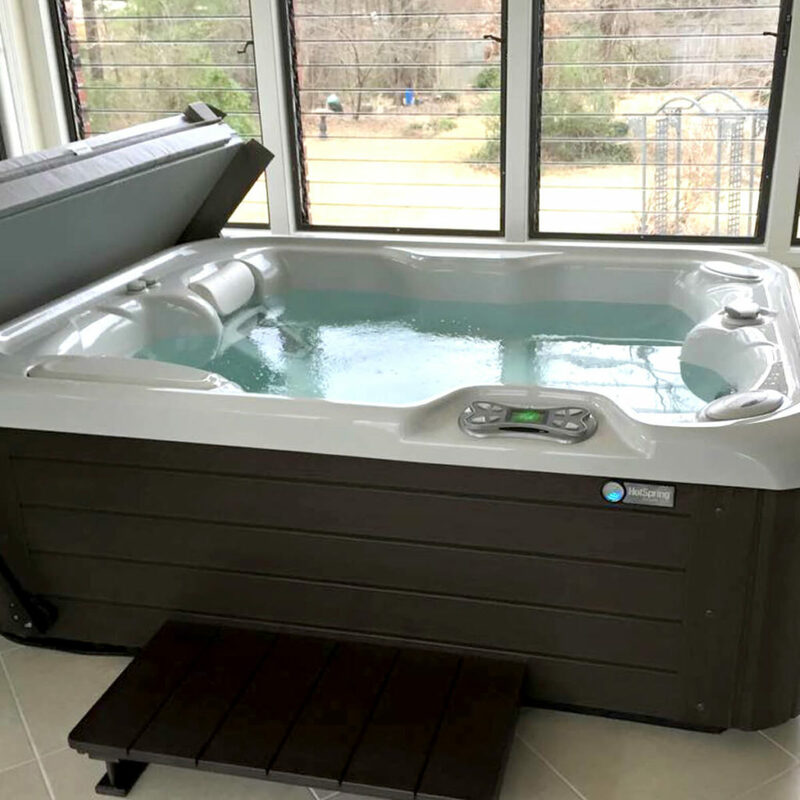 The most popular models for indoor use are the Jetsetter and the Prodigy Hot Spring spas. For best results consult with a qualified builder or architect and call us for specifications! Plan to reinforce the floor to handle the weight of the model you select. Remember, if you’re building a new room; have the hot tub installed before you close up that last wall. WATCH WHERE YOU STEP. Choose a floor material with good traction and drainage when wet. Best bet is a matte finish, non-slip tile. Install a floor drain for easy cleanup and for draining the spa. GO WITH THE FLOW. Although your hot tub from Olympic is portable and requires no external plumbing, you’ll need a convenient water source for filling. Install a hose bib in the room to make fill-ups easy. DRYWALL, YES DRY WALL. A tight-fitting cover keeps moisture in the hot tub, but when the lid comes off, the room steams up fast. Use water-resistant drywall -made for bathrooms. Or better yet cement walls, glass enclosures or cedar lining. Don’t forget to install an intact vapor barrier under the wall covering to prevent dry rot of studs and joists. FAN IN. FAN ON. A powerful, quiet vent fan gets the humidity out of the room fast without disturbing your hot tub time. Call an HVAC contractor to help install the fan correctly as well and to help you select the right size vent fan and placement. Best bet- get one with a timer, thermostat and humidistat in one unit. HEAT THE SPACE. To minimize moisture condensation, make sure the room is adequately heated. A ceiling fan enhances air circulation. NO SMELLS ALLOWED! We recommend natural odorless SilkBalance or the ACE salt water system for easy care, fresh clean water and soft smooth skin. Call us before you begin your project. A quick phone call can save you hours of grief and boatloads of money. 1-888-297-0866.